The winds have been unmercifully harsh this winter. Many nights I have lain in bed wondering how long my maple tree can withstand the onslaught of bitter two AM winds, only to find by morning she is still standing, sometimes her long fingers dipped in layers of brilliant ice. The garden is paralyzed right now. The ground has long since frozen and it seems impossible that life could spring again from this Arctic tundra. But all is not lost. In the comfort of my bedroom near my bedside table there stands a large bookcase devoted entirely to the pleasures of the garden. Here it is rarely winter. Thomas Jefferson waxes on about pea varieties and springtime budgets, Christopher Lloyd discusses color in unconventional ways, Ana Pavord dissects the world’s fascination with the Tulip, and the occasional DK volume stands ready to entertain me on lazy days. There are guides to botany and botrytis, landscapes and linaria, pests and propagation, and there are even one or two books about the pleasures of backyard poultry. There are more perspectives out there than pages – and more pictures than a serious gardener has any right to peruse. Volumes sit higgledy-piggeldy next to and on top of one another, each competing for space that isn’t there. The awkwardly sized books turn into bookends stacked seven-high. A few have escaped the shelves and found a new home on top of the case – enjoying their elbow room and understandably reluctant to be reshelved. And that’s just my gardening case. 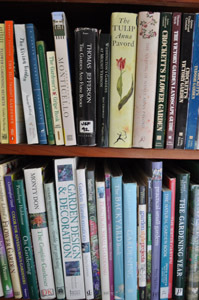 I find it interesting that most of the gardeners I know are as infatuated by their bookcases as they are their green spaces. I cannot tell you what the connection is, probably some left brain/right brain complexity that is beyond the scope of this article – but the connection exists nonetheless. Give me your grubby gardener battling beetles, caterpillars and all manner of hymenoptera, and I will give you a sheepish bibliophile battling the inverse ratios of space to books. I can only postulate that it might be a survival mechanism for gardeners forced by winter’s unmerciful winds to find solace within the wholly artificial space of their own four walls – poor darlings. I do not stop reading in the summer, I just read less, and the act is most often one of reference, not relaxation. However, as the season draws on and the leaves begin to turn, the stack of books next to my bedside table increases dramatically, and are joined by all manner of catalogs, brochures, fact sheets and notebooks. My duvet-draped lap becomes a clearing house for those volumes that I will browse tonight, those for tomorrow, those I-don’t-feel-like-reading-but-have-to-at-some-point and those for I-don’t-know-when-but-sometime-soon. I know I have a problem. My idea of a wonderful night out with my husband is a quick curry followed by two hours at the used bookstore. I live in fear of someday bringing home a new book and excitedly opening it at bedtime – only to find that I already have it and that I am in desperate need of an intervention. There is more than a ninety percent probability that this will happen – and a hundred percent probability that I will never admit to it. These books are my friends. They are my refuge in the evenings and my quiet companions on winter mornings when it is far too cold to take my coffee into the garden. My children will inherit them, and no doubt, at least half will end up propping up sagging bookcases at the local thrift store – waiting for someone like me to find them and wonder who scribbled in the margins and left copious Post-it notes marking important passages. No matter. I shall never give them up. For when the wind blows, the house groans and the furnace runs like there is no tomorrow, the pleasures of the garden are to be found in the written word. OK, I will confess, I have bought the same gardening book twice. I would like to think it is because I have two homes, so when I check the shelves, I do not see it. But then I find it in the country house, and my heart sinks. I ususally pawn them off on a friend, telling them I bought it for them, as I thought that they would like it. Now you know! 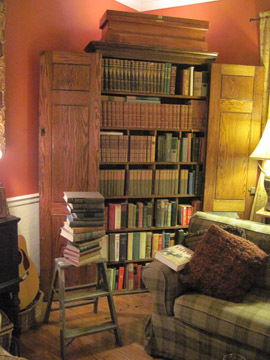 Deborah – What happens in the bookcase, stays in the bookcase. LOL. The title of your article attracted my attention immediately! My children keep saying that to me: “What are you going to do with all your books?” Some books I have acquired two or three copies of on purpose so that I can recommend them without fear of never seeing them again. Yes, I do have a check-out book, but I have found that it isn’t always filled in. I cannot live without books. It’s impossible! Lynne – I won’t give mine up either, but is the writing on the wall for the rest of the world? I went to the local middle school yesterday to inquire about their classes – and was taken on a tour. As we passed by the Library, I said “You have a nice library” – to which the guide corrected me and said “It’s a Media Center now.” I was shocked and said “What did the Librarian have to say about that?” and he said “Not much – she’s a Media Center Specialist now.” When I wonder will the Great Reading Room at the British Museum become The Great Media Room? Sooner than we think, methinks. – And am I even justified in writing these subversive comments, as I am doing so on a website with the help of a word processor? 🙂 Hmmmmmmm…. A compelling topic. I buy books, am given books as gifts, get review books, and sometimes inherit books. Alas, they cannot all stay. 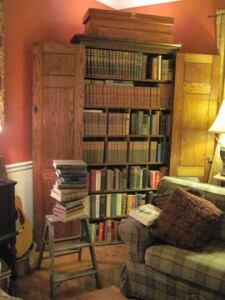 I spent yesterday afternoon fondling many books – and some of them are going to my friend’s bookshop. 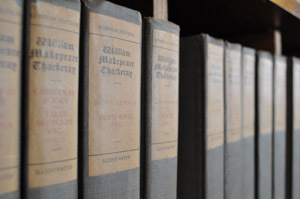 In the summer I fondle a few more books (not all of the gardening variety) and take a few to my Library’s big book sale. The hope is that I will remove one or two more books than I will bring back from that sale. Well, here I sit in mid-winter, with garden reference books open on both sides, garden blogs open on the computer screen in front of me, my current garden narrative reading sitting on the floor beside my favorite reading chair downstairs, and a vase of forced forsythia nearby. I have actually bought the same book twice KNOWINGLY – is that akin to hoarding? I love Peter Beale’s Classic Roses so much that I had to have one perfect copy and one to take into the garden, turn down pages, leave outside. Is that book crazy enough?